a) Original Brownian motion. b) Same but squaring the formula for the square root. c) Formula of the square root taken as a stochastic equation. d) Same from the stochastic equation in this post. There is now way to distinguish each other and the original Brownian motion is completely recovered by taking the square of the square root process computed in three different ways. Each one of these completely supports the conclusions we have drawn in our published paper. 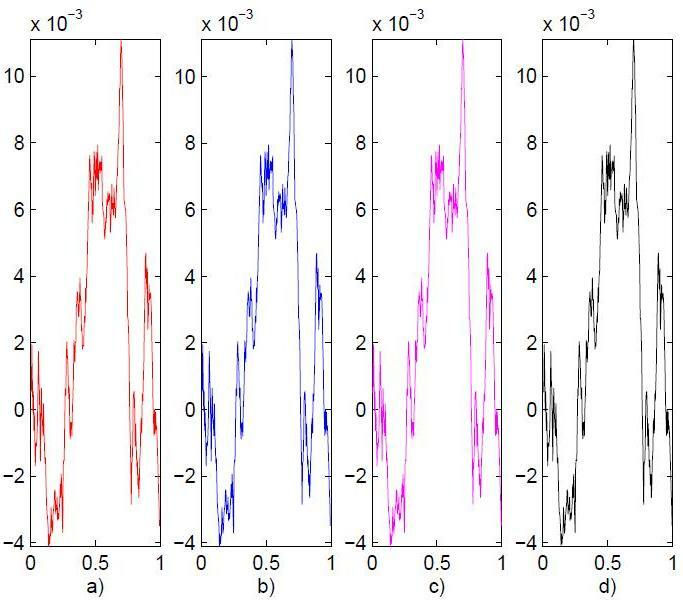 You can find the code to recover this figure in our arxiv paper. It is obtained by a Monte Carlo simulation with 10000 independent paths. You can play with it changing the parameters as you like. This paper has an important consequence: Our current mathematical understanding of stochastic processes should be properly extended to account for our results. As a by-product, we have shown how, using Pauli matrices, this idea can be generalized to include spin introducing a new class of stochastic processes in a Clifford algebra. In conclusion, we would like to remember that, it does not matter what your mathematical definition could be, a stochastic process is always a well-defined entity on a numerical ground. Tests can be easily performed as we proved here. You are currently browsing the The Gauge Connection blog archives for March, 2014.